No I’m not talking about my Saturday night. Well technically I am, and yes if I’m honest I was a title wrecked, couldn’t complete one of @SeanLerwill workouts! Gt about 15mins in and flaked! I personally think it wasn’t my weak woman brain but more the blessing of a busy few weeks workwise! Anyways back to the matter of a great film being very poorly rated previously and my desire to counter act, some idiots opinion. 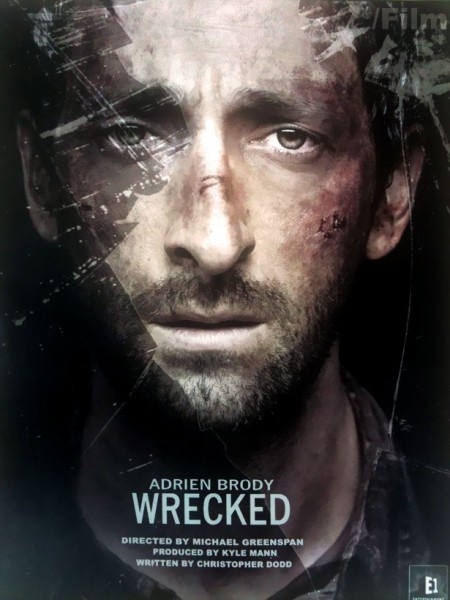 Wrecked directed by Micheal Greenspan, written by Christopher Dodd and starring the brilliant Adrien Brody, is definitely worth a watch. More so in fact, I would actually say must watch for actors and actress’s. With hardly any speech throughout, I was hooked from start to finish. I must admit being ever so squeamish I did have to look away at a couple of points but mainly through my fingers as I didn’t want to miss any detail that would start to make sense of the film. We are literally kept guessing throughout the whole of the film as to what really happened to leave Brody in his predicament. I really don’t want to divulge much more as I want everyone to make their own opinions. I personally was very pleased, with my choice of movie for Saturday night. It was a new experience of movie watching. Slightly like buried but so much more, that’s the most I’m saying. Previous postSean Lerwill’s Wednesday Workout! Next postThe cutest dog in the world, well till I find mine!